Organic vs Inorganic: Food Fight! Organic produce is grown under the watchful eye of the USDA organic program. But there's some ongoing controversy about organic vs inorganic fruits and vegetables. What makes organic fruit different, and are organic vegetables safer or healthier to eat? The growth of the market for organic fruit and vegetables has been nothing less than explosive, in the United States as well as Europe. From 2004 to 2006, sales of organic food increased by over 38%, due in large part to sales of organic produce. The economic downturn has dampened growth, but it's still increasing by about five percent each month, according to some estimates. What makes organic fruits and vegetables different is the way they're grown. For example, only fertilizers like compost or manure can be used; chemical fertilizers are not allowed, nor are most synthetic herbicides, pesticides, and fungicides. Thus, there is a big environmental benefit to organic produce that even the industry's most stalwart critics won't deny. Cheaper: You'll pay slightly more for organic fruit and veggies since they require more time and labor to bring to market. More nutritious: There's almost no evidence that organic produce contains more nutrients than regular produce. An organic orange, for example, has about the same amount of vitamin C as a regular orange. Clean: Remember to wash organic produce to remove dirt and bacteria, and take all normal food-handling precautions when preparing organic produce. Pesticide-free: Most pesticides are not permitted under the USDA National Organic Program, but pesticides like tetracycline, copper compounds, streptomycin and dozens of others are allowed under certain circumstances. Local: Organic fruit and organic vegetables often come from miles away, and may require lots of energy to transport. In the food fight over organic vs inorganic, this fact makes organic produce a little less appealing. Organic Produce: Worth the Money? Because organic food costs more, many consumers wonder if they're getting a good deal. One thing is certain: the environmental impacts of organic farming are vastly superior to those of factory farming, with its reliance on synthetic pesticides, petroleum-based fertilizers, and other practices. Since how you shop is at least as important as how you vote, keep in mind how your produce shopping affects the environment. If you're a budget-conscious shopper who's looking to save at the grocery store, you might want to remember that some inorganic produce has low levels of pesticides, making it comparable to organic. In general, if you eat the skin (peaches, apples, celery, berries), buy organic. But if you peel or discard the rind (pineapples, onions, avocados, corn), you might be OK with regular produce. 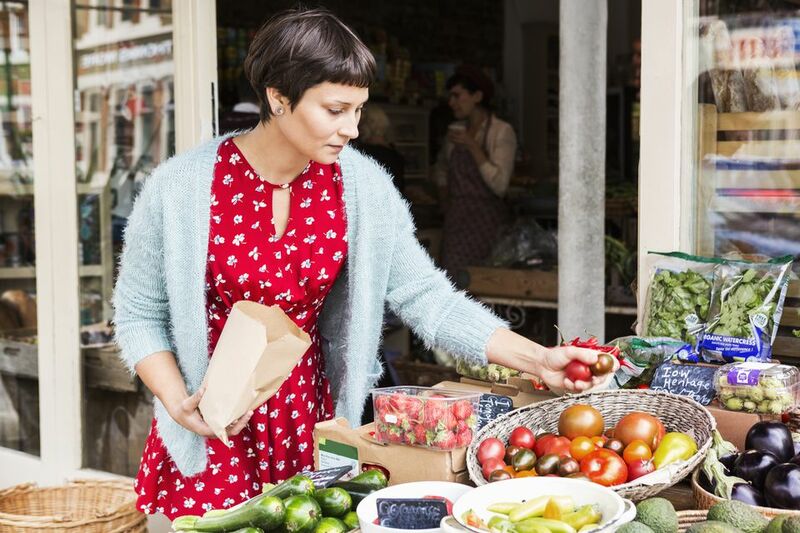 Here's a detailed list of smart buys in organic and inorganic produce.